The first cemetery, I ever visited as a genealogist, was in Union Township, Lawrence County, OH about four years ago when I still thought I was a Spears. The story is worth telling because of several lessons that I learned. 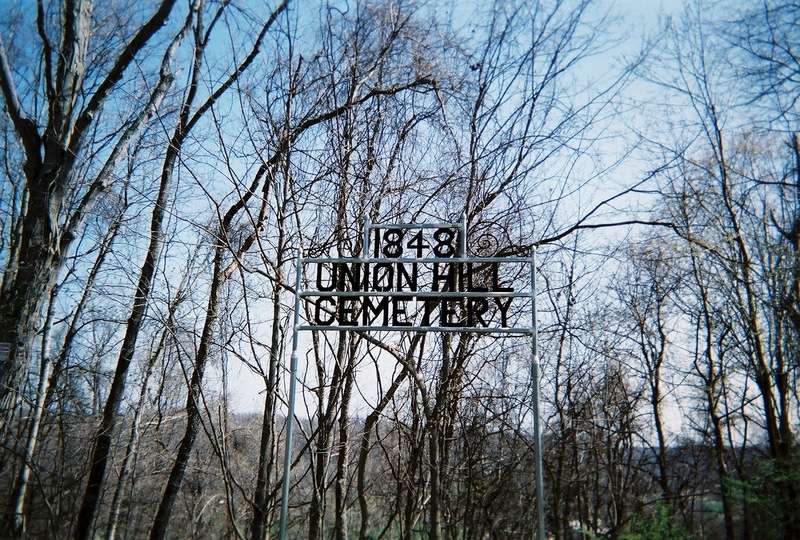 Union Hill, like a lot of old cemeteries that you might visit in search of your ancestors, is very hard to find if you are not a local. I was lucky that I had been working with Ellen Gammon, a professional genealogist in Lawrence County, for several months before my trip. I introduced Ellen in my blog post of Oct 19, 2011. 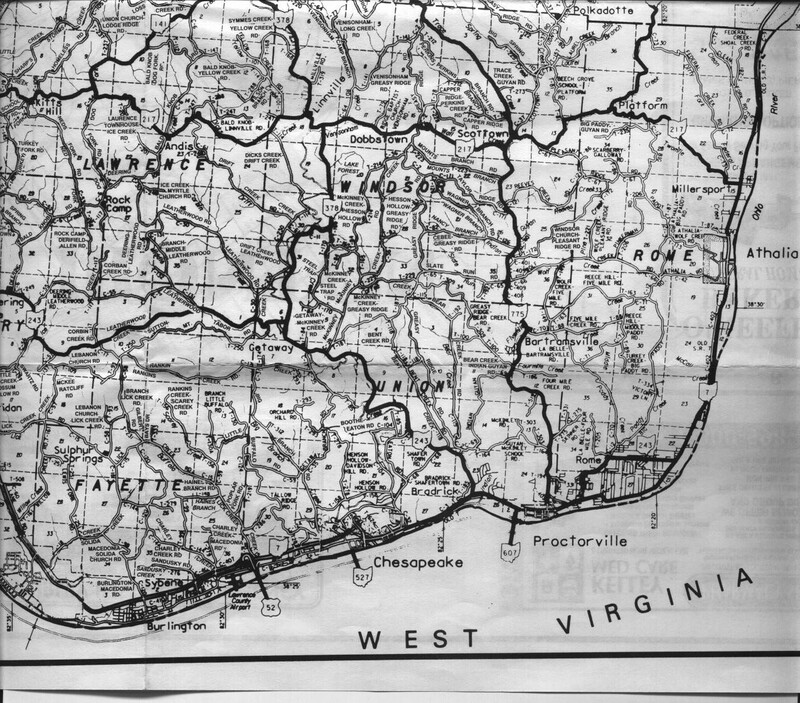 Before my husband, Bert, and I even left Georgia, Ellen sent us a detailed topographic map showing the location of Union Hill Cemetery. Because this cemetery, like so many others in rural parts of America, is so far off the beaten track, we could never have found it without this map. So, Cemetery Lesson # 1 -- to prevent frustrating and disappointing efforts to find remote family cemeteries, always try to find out as much as possible about the exact location before you begin your trip. Contact local libraries and county offices to inquire about maps. If you can find a US Geological Survey (USGS) map/webpage with longitude and latitude, you can use a Global Positioning System (GPS) device to help guide you. An example of this type of tool is the Union Hill USGS information webpage. At-home preparation before your visit will pay off 1000%! You can do a Google search on the name of your cemetery. This may turn up maps, historical information, phone numbers, websites, and even, if you are very lucky, a list of people in the graveyeard. 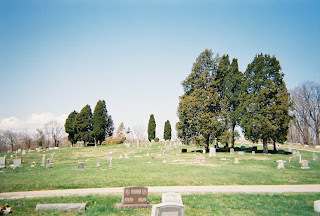 Findagrave and Interment.net are two websites that allow you to search for cemeteries across the US. After trip preparations were complete, Bert and I hit the road. 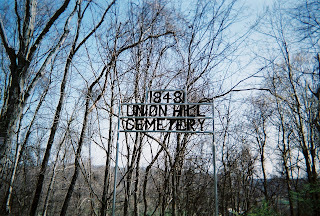 When we arrived at Union Hill, we found that we were the only ones there. 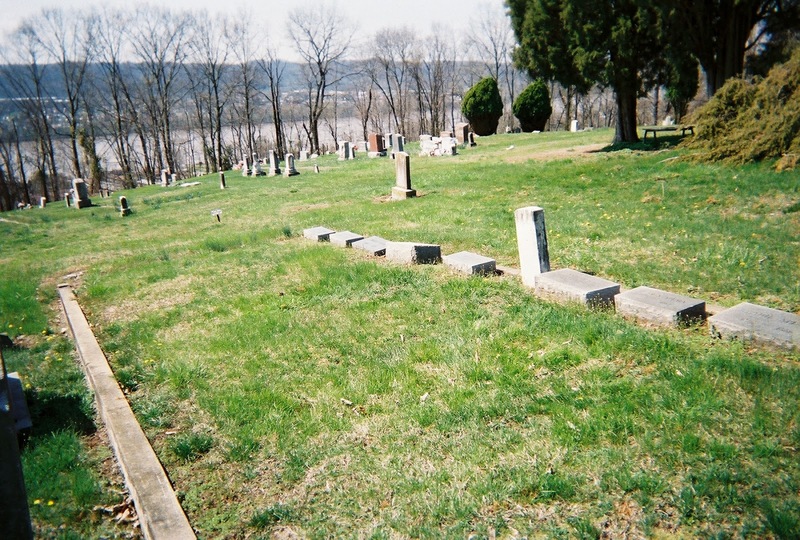 The cemetery is located on several hills and is about 10 acres. There was no office. We had no map of the cemetery itself so we started walking up and down the hills, peering at gravestones. We hadn’t yet found any Spears graves when we saw a car drive up. I went up to say hello and the driver told me that there was a sexton living down the road who had a map of the cemetery! She even knew the man. When we said that we didn’t want to bother him, she said he was just sitting at home and would be glad to help us. Then she told my husband to follow her to the sexton’s house. Meanwhile I stayed behind to continue searching. By the time Bert returned with the map, I still hadn’t found the Spears plot. But sure enough, the map showed us right where it was!! Cemetery Lesson #2 – always talk to people you meet in a cemetery; especially in small, rural graveyards where the people who are visiting their loved ones are often locals who may have a wealth of information to share with you. They could even be related! The third lesson came when Bert tried to take a picture of the Spears family plot. Our digital camera wouldn’t work! No problem, we thought. Bert would find a camera store in Ironton or a WalMart and pick up a new battery while I continued looking at the grave stones. What we didn’t count on was this is a small, non-urban area. No camera stores. WalMart carried regular batteries but not the special camera battery that we needed. Cemetery Lesson #3 – always bring more than one camera with you. Disposable cameras cost very little and can mean that you actually bring home some photos if your real camera stops working. An extra memory card is also worth tucking in your camera case. Once you are in the cemetery and actually locate an ancestor’s grave, new challenges may arise. You walk up to the grave with great anticipation. Is there a marker or stone? And, if you find a grave marker, what condition is it in? What material is it made from and if there are symbols carved on the stone, what do they mean? A brief, easy-to-follow guide to tombstone identification and cleaning is available from Everlife Memorials. An in-depth discussion of how to determine the type of stone and how to clean that stone is at The Association for GraveStone Studies. I wish that I had known about these information sites before I went to Union Hill Cemetery. I brought no cleaning supplies with me. 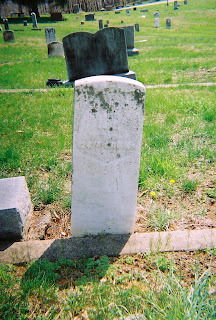 My ancestor, David Spears' tombstone, was in poor condition. 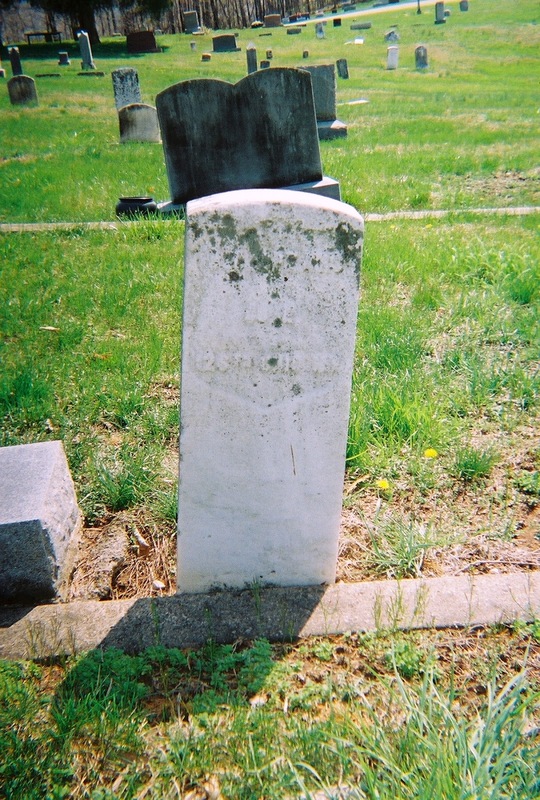 Cemetery Lesson #4 – although you may want very much to “clean” a tombstone of the moss, lichen, dirt, and other materials that might be obstructing your view of the lettering beneath, remember to check to see the composition of the stone before you begin any debris removal procedure. And be sure to use the recommended cleaning substances and tools so as to minimize any damage to the stone. 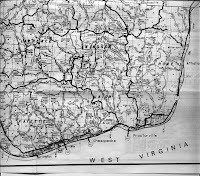 Many of us have ancestors who lived in states far from where we live now. This makes regular maintanence visits difficult if not impossible. 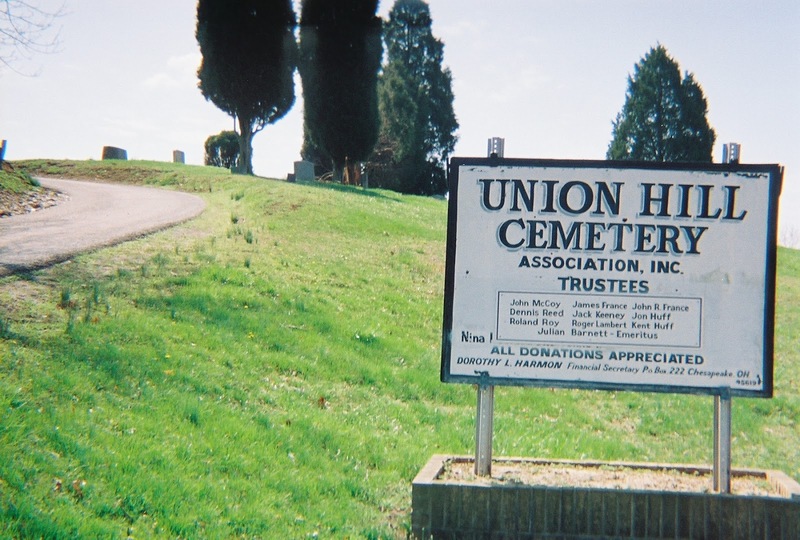 A tip that I learned from Union Hill Cemetery is to look for any signage that might be in the graveyard. Also don't forget to look at the target cemetery on-line for contact information. You can send in a donation for cemetery upkeep. Perhaps the most important lesson to learn when planning a cemetery visit is to be sure that you bring along a friend. Another person is good for safety purposes (in rural and in urban cemeteries) and as another pair of eyes/hands to help you as you travel the grounds searching for the graves of your ancestors. Using a little cemetery savvy when you set out to find your ancestors’ graves will go a long way in helping you reach your goals and making sure that you leave the graveyard in the same or better condition than you found it.